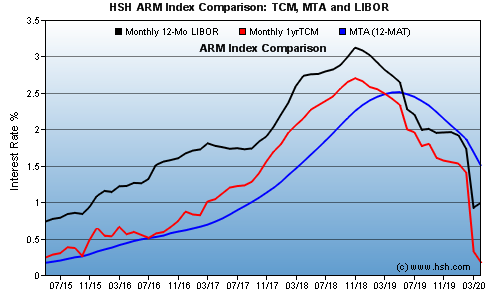 This graph compares monthly values of the One-Year US Treasury Constant Maturity against an HSH-calculated replacement of Fannie Mae LIBOR and the 12-month Moving Treasury Average (MTA). All are popular indices for changing interest rates on many kinds of Adjustable Rate Mortgages. You might be surprised to find that the LIBOR, while similar, frequently has a higher value than does the Treasury. ARMs tied to the LIBOR, however, often have lower margins (markups) above the index value -- typically about 225 basis points (2.25%), versus about 275 basis points (2.75%) for Treasury ARMs. ARMs tied to the MTA frequently have margins of 250 basis points (2.5%). As a result, when fully-indexed (your rate equals the sum of the value of the index plus the margin), the two frequently trend very closely with each other. However, recent market turbulence -- investors flocking to guaranteed investments -- means Treasuries have lower yields right now. Don't get too excited by that fact, however. The average difference over time is just 10 basis points (.10%), and the median difference is also just 10 basis points. Factoring for rounding and caps, you'll probably find no consistent savings with one over the other. At the moment, the pendulum has swung in favor of the Treasury. But tomorrow's another day. The MTA -- an average of the previous twelve values of the monthly Treasury -- smoothes out the spiky nature of the 'raw' Treasury value. However, because it looks back over a long period, it can take a long time to realize increases in rates which have already occurred. When rates are rising, there's some benefit to a slower moving index, but less immediate benefit when rates are falling. Even if underlying interest rates stopped rising right now, the MTA would continue its climb for a year or more from today. Like all ARMs, whether you do better or worse is a bit of a gamble, depending upon when your ARM comes due to adjust, any caps which limit the rate change from period to period, and other factors. To see some of the values which make up the chart, click here for the MTA and here for the HSH Libor series. HSH grants permission to utilize this graph providing that the graph and its contents are not altered in any way.